Looking For The Best Kauai Surf Lessons? Poipu Beach Surf School, located in sunny Poipu, on the south shore of Kauai. Great location for beginner and intermediate surfers! Learn the ancient Hawaiian sport of surfing, with professional and friendly staff in a private bay, adjacent from other surf schools, making your experience more enjoyable and private. While on Kauai surf lessons are a must. 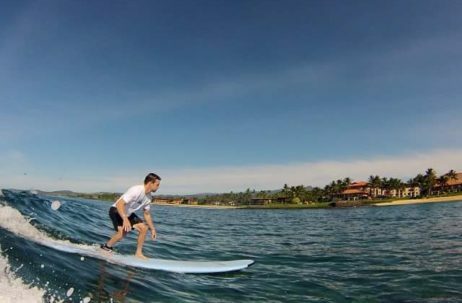 Once you take a lesson you can rent a board and catch waves all along our beautiful coastline! 2 hour private or group lessons are available, seven days a week, for children 6 years of age and up and adults of any age. Our instructors are lifeguard trained and CPR certified, making safety and service our top priorities. In fact, our instructors stay with our students throughout the ENTIRE lesson in order to ensure maximum safety and fun. Sleep in, relax, hike or hit the beach during the day & check in for your Surf Lesson at 4:00pm! New SUMMER ONLY afternoon surf lessons. A beautiful time to be out on the water in the late sun. This lesson is for the intermediate surfer. Instructors are next to you in line-up, giving extra instruction, helping you learn different techniques, taking your surfing to the next level, helping you eliminate bad habits.